Just give endurance riders the slightest excuse to get together, and they'll do it. 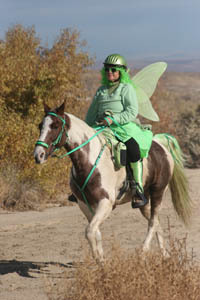 Add in a near full moon, and a chance to play dress-up, and you end up with the 2-day Hallowed Weenies endurance ride at the end of the season in the Owyhee Desert. 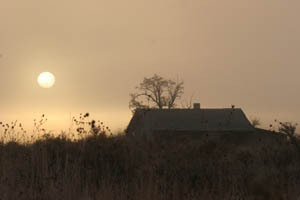 And with it being Halloween, there were some scary things to worry about on the 50 and 25 mile trails: Day 1 you rode by "Dead Cow Farm" - an abandoned and rather creepy dairy; by the Idaho Ecology site - the P.C. name for the toxic waste dump near the Snake River; on a sloped trail right by a barbed wire fence; over an old bombing range; and during hunting season. Day 2 you rode over the site of the Utter Disaster Massacre, and, since not quite all of the last bit of trail had completely gotten marked, some of us got lost out there, and it's still hunting season. Yeah. But the creatures still came out in Halloween droves. There were Fairies on the prairie, many Come to Save the World - a Musketeer, a Crusader, Zorro, an Oreana Cowboy (wait - that was a REAL Oreana Cowboy - Shane pulled Mary's stuck truck out of the sand while she was off riding in the LD), a Star Wars Jawa ("I can't abide those Jawas. Disgusting creatures!" said C3PO - who can quote that entire movie with me? ), a skeleton (the horse), a soccer ball (the horse) and referee, Gumby & Pokey, Michael Jackson (who worked as our in and out timer), Where's Waldo, a college graduate, two pink flamingos, Pocahontas, a clown, an angel, of course a devil (someone stole the devil's cape and became impromptu Little Red Riding Hood), monsters, a drunken man on a mule, and Argentinean vaqueros. Steph commented later, "These were ADULTS! - this is GREAT!" 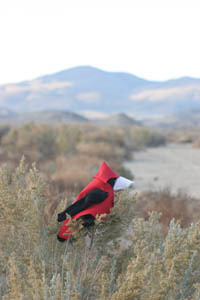 Even the Raven participated, dressing up as a Cardinal! (Someone, I'm not saying who, actually made that bird a costume!). The Musketeer came all the way from New York City (New York City!) to ride. Sandra Fratelliere rode Steph and John's mare Sunny on her first 50, and it was Sandra's first ride in the Pacific Northwest. The two pink flamingos were shedding feathers their entire 25 miles... some day a BLM bird biologist will be hiking out there, discover some pink feathers, and be amazed that pink flamingos have inhabited the Owyhee desert! 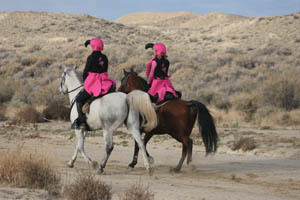 The feathers actually served an extra purpose; since there weren't an abundance of pink ribbons to mark the trail (commented one rider), the pink feathers served as markers for those in doubt of their directions. And Day One was all-new Owyhee trails. Basecamp was Regina Rose's house down the road from Oreana. Riders took off south, across the highway, up Birch Creek wash, (had a vet check), did a loop through scenic Birch Creek Canyon, (had a vet check), and back home. The LD's hauled out to the vet check to start and did their two loops, through Birch Creek Canyon, (had a vet check), then did a shorter out-and-back loop to finish. After the awful weather the week before (that is just one point of view!) of wind, cold, rain, and a bit of snow - the weather was just perfect (a unanimous point of view): cool and partly sunny all day, and minimal wind. And the sunset was spectacular. And even more spectacular was the dinner (for the second night in a row), cooked by Oreana neighbors Amy and Shane and Jessica and Isaac Riley and a couple of their friends. The indoor arena where we ate sounded like the Riley fan club: "OMG!" "This is soooooo good!" "I'm coming back next year just for the dinners!" And the family came around making sure you went back for seconds. Which was almost impossible after the huge firsts they heaped on your plate, but I think everybody managed. And then there was the dessert... The food truly was stunning (both nights) after a long working/riding/outdoor day. All the scary trail obstacles were conquered with no problems. 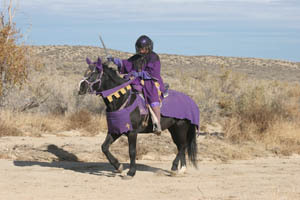 However Gary Pegg's Tennessee Walker stallion Gus's Mountain Mack, in the middle of the 18-mile loop of the LD, colicked. There was nothing for Gary to do but keep riding him, forcing him to walk in - if he got off to walk, the horse tried to go down. Annerose Carlile and her horse stayed with them; as soon as they got Gus in to the vet check the vets treated him and stabilized him, and he got hauled off to a clinic, where he immediately went into surgery. Awful news for everybody. And our horse Rushcreek Mac wasn't quite right after he finished the 50. After it got dark, he was standing off by himself, away from Rhett and Jose and Sunny, not eating, and looking dull. Steph went to get the vet, Robert Washington; he checked Mac out and found a small compaction in the colon, but nothing he was terribly worried about. Robert gave Mac some tranquilizers, and stomach tubed him with oil and electrolytes. John sat up with him in the dark and cold, until Mac suddenly snapped out of it. We kept him separated (and Sandra got up to check on him in the middle of the night), and he was fine in the morning. 24 of 28 finished the 50, and 12 of 13 finished the LD, including a couple who came out from Oregon to do their first endurance ride on their Peruvian Pasos. They had a great time, and decided to brave the Utter Disaster Trail the next morning.